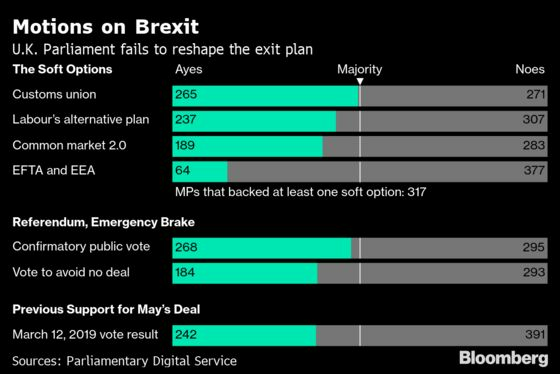 (Bloomberg) -- Prime Minister Theresa May’s Brexit deal was defeated for a third time in Parliament and the choices now are another extension, a no-deal exit on April 12, or a general election. May’s team says she’s going to keep fighting to get a deal done quickly enough to avoid a long extension that would require the U.K. to take part in European elections -- but it’s far from clear the EU will agree. April 1: Lawmakers to vote on alternatives to May’s Brexit deal. These could include staying in the customs union or even demanding a referendum on the deal. Early April: May might try to put her deal, perhaps tweaked to reflect what Parliament decides on April 1, back to lawmakers for a vote. She’ll also have to speak to the EU about the prospect of a short extension that would allow the U.K. to avoid joining EU elections on May 23. April 10: An EU summit. Usually the main issues are hashed out in the days leading up to the main event. April 12: The new deadline. By now the U.K. has to decide if it’s holding European Parliament elections. At this point, the choice is no-deal, a long extension, or if it can negotiate it, another short extension. May 23-26: European Parliament elections. If the U.K. doesn’t hold elections, and doesn’t have a deal in place, it will probably be chucked out of the bloc, or at the very least face legal action.